KIEV, Ukraine -- The disturbances in eastern Ukraine demonstrate that Russia wants to destabilise the country before next month’s election. Petro Poroshenko, the front-runner in Ukraine’s presidential election, due on May 25th, exudes confidence. His words are like psychotherapy. After a revolutionary winter, the overthrow of a president, Viktor Yanukovych, and the annexation of Crimea by Russia, Ukrainians feel fragile and exhausted. They crave respite, peace and normal life. Instead, they are getting provocations, threats of invasion and gas-price rises, and Russian-fuelled separatism. All this is part of what is known as the “Russian spring”. The activity of Russian agents in eastern Ukraine had seemed to be subsiding; separatist rallies were abating. But on April 6th the Russian spring returned spectacularly. In a carefully co-ordinated action, groups of men, some armed, took over government buildings in Donetsk, Luhansk and Kharkiv, declared the “independence” of eastern Ukrainian republics, demanded referendums and called for Russian assistance. They aped the Maidan protesters in Kiev with barricades made of car tyres and the distribution of food. The theatrics were said to be directed from Moscow with money from Mr Yanukovych and his son, who still control some local mayors in the Donetsk region. Yet there was little popular support, as most people in the east support Ukraine’s sovereignty. That small invading groups could so easily take over government buildings testified to the weakness of the interim Kiev government and the inaction of the local police, who are demoralised and humiliated by having to serve those whom they fought against only a few weeks ago. Senior officials, including Arsen Avakov, the interior minister, were sent to the region to supervise the police. Some government buildings were then retaken, though others remain in the hands of separatists. John Kerry, America’s secretary of state, called Russia’s actions “an illegal and illegitimate effort to destabilise a sovereign state. Russia may yet use its army, ultimately the only way that it could grab more Ukrainian territory. But its preference is to achieve this outcome by forcing Ukraine to accept what it calls “federalisation”, which in reality means partition. The threat of military action and the fomenting of separatism in the east and south are designed to persuade the Americans and Europeans to support Russia in this goal, as the lesser of two evils. Ukrainian politicians accept that decentralisation of power would make local government more transparent and accountable. 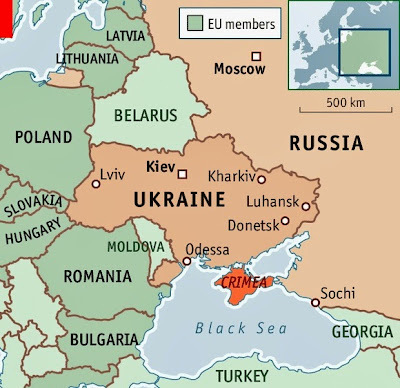 But they strongly resist the idea of self-determination for each region as demanded by the Kremlin (which has, in effect, rejected the idea for Russia itself). Whether Russia orders tanks across the border with Ukraine when its “federalist” plan is rejected or whether it continues to destabilise the country by other means, it is certainly not about to leave Ukraine alone. The immediate goal may be to torpedo the presidential election and stop the emergence of a strong, legitimate government. Many Ukrainian observers fear that Russia will use May 9th, Victory Day, to stage more provocations. Russia’s propaganda is based on second world war rhetoric, portraying the government in Kiev as western Ukrainian “fascists” attacking Russian-speakers in the east and the south. Yulia Tymoshenko, a former prime minister who was released from jail after Mr Yanukovych’s overthrow and is now running against Mr Poroshenko for president, says it is essential that Ukraine keeps calm and does not respond to Vladimir Putin’s provocations. “Ukraine has no single trump card, no real argument to stop military aggression. The only talks between Kiev and Moscow would be about complete capitulation,” she argues. The fate of Ukraine may ultimately be decided in Moscow, Washington and Brussels, but the country’s political and business elite is not powerless. The failure to have representatives from the east in the interim government has made Mr Putin’s meddling easier. But the intervention of Ukrainian oligarchs has made it harder. Consider Rinat Akhmetov, Ukraine’s richest businessman and Mr Yanukovych’s former backer, who emerged as an important power-broker in Donetsk, going to see the separatists in the middle of the night. Mr Akhmetov employs some 300,000 people in the region, and has no intention of losing his dominance there. His miners are wary of Russia, which exports coal to Ukraine. But he also has no interest in a strong central power in Kiev that could deprive him of the privileges on which his businesses have long thrived. He seems to support Mrs Tymoshenko, who would also be more palatable to the Kremlin. In the polls, Mr Poroshenko is well ahead, even though Mrs Tymoshenko’s core support is more enthusiastic, especially in rural areas. Mr Poroshenko’s rating of nearly 30% has been boosted by a deal with Vitaly Klitschko, a former heavyweight boxer, who dropped out of the presidential race in his favor. As a successful businessman and chocolate king, Mr Poroshenko is helpfully associated with peace and stability. He says his priority is to fight corruption, which has permeated Ukraine for 20 years. “It is also the only way to glue the country together. Maidan was not a pro-western revolution or pro-eastern revolution. It was an anti-criminal and anti-corruption revolution,” he says. Yet many Ukrainians were dismayed when they heard that Mr Poroshenko had been endorsed by Dmitry Firtash, a main beneficiary of shady gas deals between Russia and Ukraine who has just been arrested in Austria at America’s request, and his business partner, Sergei Levochkin, a former chief of staff to Mr Yanukovych. “At the moment, the country can only be held together by the union of the oligarchs”, says Yulia Mostovaya, editor of the weekly Zerkalo Nedeli. “The renewal of the political system which everyone was hoping for has not taken place”. Whoever wins the election will be closely scrutinised by Maidan. A new government will have to make reforms without inflicting too much pain on the east or antagonising the west. Building a state and fighting corruption in a country dealing with separatism, outside aggression and economic pressure may prove all but impossible. Now, with Ukraine’s existence at stake, there may be no other way.